I wrote earlier about the way the Department of Work and Pensions (DWP) heavily micro-managed the recent Mortality Statistics release, and how the Government are using an excessively bureaucratic approach to ensure that no inferences are drawn from the data published, insisting that it’s “wrong” to link the mortality rates of sick and disabled people with punitive, Conservative austerity policies. However, the accounts and experiences of sick and disabled people and their families (recorded in the media, in parliamentary inquiries, Commons debates – all preserved on the Hansard record) inform us that there is a clear correlation between the Tory “reforms” and increased distress, a loss of dignity and autonomy, financial insecurity and insolvency, increasing ill health, and sometimes, the death, of disabled people. When confronted in the Commons, Iain Duncan Smith and other ministers dispensed with civilised debate, and simply blocked any discussion regarding concerns raised by the opposition about the negative impact of the Tory welfare cuts on sick and disabled people. Values of decency and legitimate concerns about the welfare of sick and disabled citizens were depreciated as mere matters of “subjective interpretation” and not as worthy subjects of political, rational or objective discussion. Bearing in mind that the information in the release came about because of many Freedom of Information (FOI) requests from many of us, and the rulings of the Information Commissioner and a tribunal (Mike Sivier from Vox Political appealed against the original decision by the Information Commissioner and the DWP to refuse the Freedom of Information requests), it’s difficult to see why the Government have been so determined, firstly, to withhold the information requested, secondly, when forced to make the release, to present the information in a decontextualized way that renders it virtually meaningless, thirdly, to go to such extraordinary lengths to instruct us how we may and may not analyse the data and fourthly, to respond to any interpretive reference to the data as “wrong”, refusing to engage in any further discussion. Unless of course it’s a Government that doesn’t want open and democratic accountability and public scrutiny of the often devastating impact of its policies. Here is the Ministerial code. Ministers are also expected to observe the seven Nolan Principles, which are the basis of the ethical standards of conduct that is expected of all holders of public office. Last year, I sent David Cameron a reminder of the established standards and ethics of Public Office, as the Coalition had exempted themselves, but he didn’t respond and it didn’t make any difference. 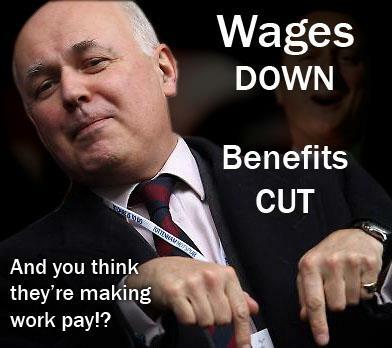 It’s true that the Department of Work Pensions (DWP) has admitted falsifying testimonies in leaflets. The DWP’s own data does indicate that people on incapacity benefits are four times more likely to die than other people in the general population. Iain Duncan Smith did tell MPs that this data did not even exist. Then he told them it did. 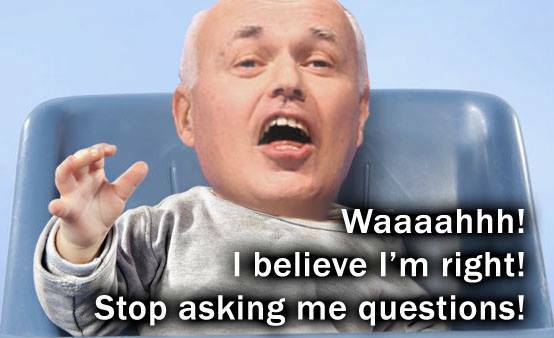 Let’s be frank here, Iain Duncan Smith has established a culture where it’s acceptable to lie, even his Curriculum Vitae is comprised of Machiavellian, narcissistic-inspired confabulations – he’s qualified only in absolute and utter tosh, he graduated without Honour. Or a degree. And it’s truly priceless that Iain Duncan Smith or David Cameron can accuse anyone of misrepresenting statistics with a straight face, given the large number of official rebukes the Tories have had from the Office for National Statistics (ONS) for manipulating or misrepresenting statistics and telling lies. I’ve already addressed a lot of the content above, however I couldn’t help but note the apparent “policing” of Debbie’s tweets. The response isn’t a rational or reasonable one, and certainly not of a standard that is expected of a prime minister. How can the use of fake statements from fake characters about fictitious “benefits” of harsh sanctions – the arbitrary and punitive removal of lifeline income to support people in meeting basic survival needs – ever “help claimants and advisers to understand the benefit system”? How is telling lies about the impact of policy and constructing fake positive testimonies ever “illustrative”? That was no “error”: it was an intentional, deceitful act designed solely to mislead the public and to justify the Conservative’s crass and primitive behaviourist approach to what was once our social security. As is the insistence that “the statistics showed it is quite wrong to suggest any causal link between the death of an individual and their benefit claim.” Tosh. The statistics showed no such thing, they did not demonstrate that there is no existing causal link – but the data was presented in a way that intentionally obscures such a link. That does not mean we can conclude there’s no connection between increased mortality and the Conservative “reforms” at all. Whilst we are warned not to draw inferences of causal links from the statistics, the prime minister thinks that it’s perfectly appropriate to do just that himself. Yet there is no empirical evidence whatsoever to support his denial of a causal link. The statistical data does not falsify or refute the proposition that such a link exists. We have plenty of recorded evidence, however, to support our proposition that Tory policies are actually harming people. Tory policies do. Margaret Thatcher’s policies caused premature deaths, too, and her Cabinet were far less harsh towards sick and disabled people than Cameron’s government. A research report which looked at over 70 existing research papers, concludes that as a result of unnecessary unemployment, welfare cuts and damaging housing policies, the former prime minister’s legacy includes the unnecessary and unjust premature death of many British citizens, together with a substantial and continuing burden of suffering and loss of well-being. It doesn’t take a genius to work out that if you inflict stress and harm on people who are already ill, by withholding their lifeline support, by constantly reassessing them and telling them they are fit for work when they clearly are not, by invalidating their experiences, by forcing them to fight for the means of survival – without the means of survival, it will probably exacerbate any illness and quite possibly this will kill them. As I discussed earlier today, Cameron and his government have consistently displayed an absolute lack of concern for sick and disabled people, who have borne the brunt of Tory austerity cuts. Yet it’s inconceivable that Conservatives don’t grasp the fact that their policies are at least potentially very harmful, and certainly very punitive in nature. I’ve discussed many times before that Tory ideology is founded on toxic subterranean values and principles, which are anachronistic and incompatible with a society that has evolved to value democracy, human rights and the socio-economic gains from our post-war settlement. Conservatives have always seen inequality as a necessary and beneficial element to a market driven economy, for example, and their policies tend to assemble a steeply hierarchical society, especially given their small state fetishism, which involves removing socio-economic support services and civilising mechanisms such as welfare, free healthcare and access to legal aid. Beneath the familiar minarchist, class contingent Conservative policies and neoliberal schema is a tacit acceptance of socioeconomic Darwinism, and a leaning towards eugenicist principles, expressed most clearly recently in the withdrawal of tax credit support for low paid families with more than two children, in order to “change behaviours” as Iain Duncan Smith put it. The reasoning behind this is the government believe they can “nudge” poor people into “breeding” less. Such a class contingent policy reflects a deep prejudice and also demonstrates an authoritarianism that is certainly incompatible with democracy and human rights. The Tories employ techniques of neutralization which are used to rationalise or justify acts that contravene social norms or that are illegal. There are five basic techniques of neutralization; denial of responsibility, denial of injury, denial of victims, condemnation of the condemners, and an appeal to higher loyalties. Such techniques allow people to neutralise and temporarily suspend their commitment to societal and moral values, and to switch off their own “inner protests”, providing them with the freedom to commit deviant acts. Some people don’t have such inner protests – psychopaths, for example – but they may employ techniques of neutralization to manipulate, and switch off the conscience protests of others. It’s clear that this is a method frequently employed by the government. The Tories systematically attempt to to distort meanings, to withhold, or deny any evidence that may expose the impact of their draconian policies on targeted social groups. For example, when they habitually use the word “reform”, when referring to is cutting funding or support. and “help” and “support” is Tory-speak that means to coerce and punish. The claim that the bedroom tax is “helping” people into work” or “helping child poverty” – when empirical research shows that 96% of those affected by the bedroom tax can NOT downsize due to a lack of available homes in their area – is a completely outrageous lie. People can’t move as there is a housing crisis, which is due to a lack of affordable homes and appropriately sized accommodation. These comments and strategies are not “mistakes”, this is how Conservatives really think. People who are prejudiced very seldom own up, and nor do bullies. They employ linguistic strategies, deceitful, diversionary and irrational responses that makes challenging them very difficult. Psychological warfare techniques that cause people to hate each other while they do more and damage. Great blog, you are brilliant and informative. I wish I could blog as good as you can. Thanks, I’m knackered, been up all night writing it. The Nasty Party politicians know full well what they are doing, but they don’t care a fig and they are trying their level best to hide it from the rest of us. Thanks to dedicated people like Mike Sivier they won’t be allowed to get away with it. Excellent articles, well-written and informative. Keep up the good work! How can we help to distribute them to a wider audience?